Duke University’s Sallie Bingham Center is an invaluable resource for studying the life and culture of American women. While the collection covers a broad range of topics on all aspects of women’s history, its strength is in Southern women and there are a great deal of resources pertaining specifically to the 19th century. This page features an extensive list of the primary sources that the collection has relating to domestic and social life in the 19th century. Any one of these collections of family correspondence and diary entries could be useful in understanding the cultural and domestic context to the Civil War, but many have not yet been archived online. The resources that can be accessed online now are found here. Other collections relating explicitly to the Civil War period can be found on the subject guides page. Hopefully the Center will continue to provide more digital resources so that the documents in this collection can be accessed by a wider audience. The Harpers Ferry story does not end when John Brown was captured early in the morning on October 18, 1859. While five members of his group managed to escape (including Barclay Coppoc, who later served in the Union army), others were not as fortunate. Albert Hazlett and John Edwin Cook, who were traveling separately, were both arrested in Pennsylvania. Hazlett was captured on October 22 and sent to Carlisle. 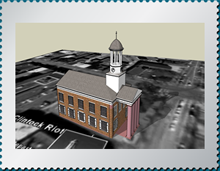 (House Divided has a 3D model of the courthouse where his extradition hearing took place). Cook was captured four days later in Franklin County. 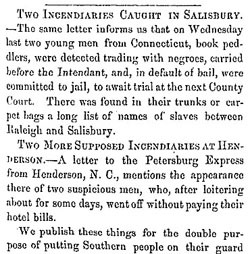 Both men were sent back to Virginia, where after short trials, they were sentenced to death. The story attracted national attention and reports were published in papers around the country, including from Illinois, Ohio, and Kansas. These reports, however, were not always accurate. The Cleveland Herald explained that someone who “[gave] his name as Wm. Harrison” was “arrested…on the suspicion that he was Capt. Cook.” William Harrison was actually the name that Hazlett used after his arrest. One can also follow the story in papers published in central Pennsylvania. The Valley of the Shadow has two papers from Franklin County – the Franklin Repository and the Valley Spirit. 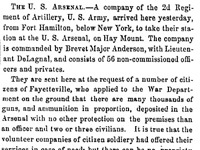 Pennsylvania Civil War Newspapers also has a number of options, including the Gettysburg Compiler and the Lancaster Intelligencer. 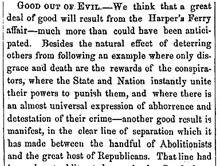 Harpers Ferry – "Good Out of Evil"
Last week I discussed a southern newspaper that argued that only legal means should be used against abolitionists who threatened southern communities. Immediately after the Harpers Ferry Raid, however, this newspaper had a different perspective. The editor was not concerned about abolitionists invading the South, but rather argued in late October 1859 that Harpers Ferry would actually reduce sectional tensions. “We think that a great deal of good will result from the Harper’s Ferry affair – much more than could have been anticipated,” as the Fayetteville Observer explained. Only “fanatics” in the North supported Brown’s raid. The Observer also argued that Harpers Ferry would split the Republican party. An editorial in an Indiana newspaper was one of “many…signs of conservative Republicans [who were] cutting loose from the ultra fragments of their party.” While the Observer later admitted that Brown’s raid had not “heal[ed] the sectional breach,” it is still important to consider this newspaper’s initial reaction. 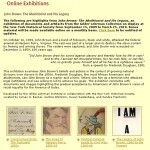 The Gilder Lehrman Institute of American History has a new online exhibit on John Brown. The exhibit covers Brown’s life in the 1850s, the attack on Harpers Ferry, and Brown’s legacy. While only a few documents are available right now, they will add more material every month through March 2010. The Gilder Lehrman Institute has a number of other online exhibits, including one on the Lincoln-Douglas Debates (co-produced by the House Divided Project). 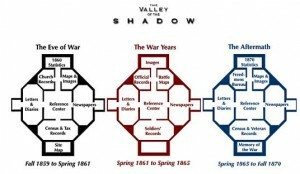 Though previously mentioned in another post, the The Valley of the Shadow Project has a wide range of primary sources from newspapers, maps, letters, and statistics all available for use in the 7-12 classroom. Broken up chronologically into three periods, the Project archives two communities (Augusta County, Virginia and Franklin County, Pennsylvania) between the years of 1859 and 1870. A particularly good lesson plan by Alice Carter compares the impact and the development of the railroads in both counties using various articles from historical newspapers. The lesson provides a teacher with preselected articles, however, one may choose to either find newspaper accounts that reflect individual class interests or allow students to search for their own, using the newspaper indexes. One special note: teachers could extend the lesson and explore the impact of railroads during reconstruction. The Valley of the Shadow is a great resource for anyone who wants to learn more about the different ways that northerners and southerners reacted to John Brown’s attack on Harpers Ferry. This digital history project, which from the Virginia Center for Digital History, focuses on two communities – Augusta County, Virginia and Franklin County, Pennsylvania – and their experiences between 1859 – 1870. Besides letters and diary entries, four newspapers are available (two newspapers were published in each county in 1859). The site also provides transcripts for most items as well as enough background information to put the material in context. While everything related to Harpers Ferry is not in a specific section on the site, it is easy to browse to find it. Understanding family life in the 19th century necessitates a look at what was popular with children at the time. This website, put together by an English professor at West Chester University, lists periodicals for children published in the nineteenth century, each of which includes a chronological list of its important articles and links to a digital copy. The magazine Youth’s Companion (which has also been digitized here) covers the most extensive range of topics, with many articles imparting a moral lesson. There are some very interesting articles from the war period to be found as well. Other publications worth noting for their relevance to the circumstances of the Civil War are the Student and Schoolmate, The Slave’s Friend, and The Little Corporal. These primary resources make a great addition to a classroom discussion of the nineteenth century from the perspective of children. 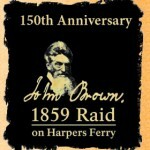 A number of organizations in West Virginia, Pennsylvania, Virginia and Maryland have organized events for the sesquicentennial anniversary of John Brown’s raid on Harpers Ferry. These include the Virginia Historical Society’s exhibit “The Portent: John Brown’s Raid in American Memory,” a reenactment of the march from the Kennedy Farm in Maryland to Harpers Ferry, and an academic symposium. The full list of events schedule for Oct – Dec 2009 is available here. (Registration is required for some of the events). In addition, the Harpers Ferry National Historic Park will commemorate Brown’s raid with a wide range of activities from Oct. 16-18. Check out the full schedule here. Teachers may want to check out this list of resources, which include links to lesson plans.